Hardwood floors are becoming a valuable asset, not only in the real estate market, but also in terms of personal enjoyment. You may have removed some old carpeting to find a neglected hardwood floor, or perhaps you are thinking of installing one. Hickory is one of the most popular choices, although there are some details you should consider before adding or restoring a hickory floor. Hickory is a common type of wood found across the United States. Boasting a Janka rating of 1820, this wood is considered the second hardest flooring type in the country. 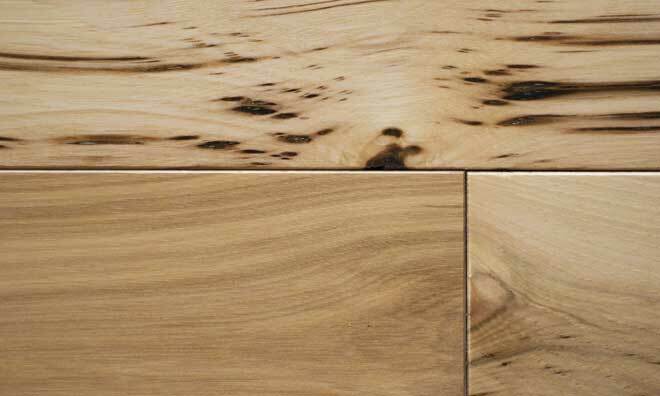 Hickory panels boast intricate wood grains, mineral streaks, knots, and color variations within single boards. Wider boards are generally preferred for floors, as it better showcases these patterns. 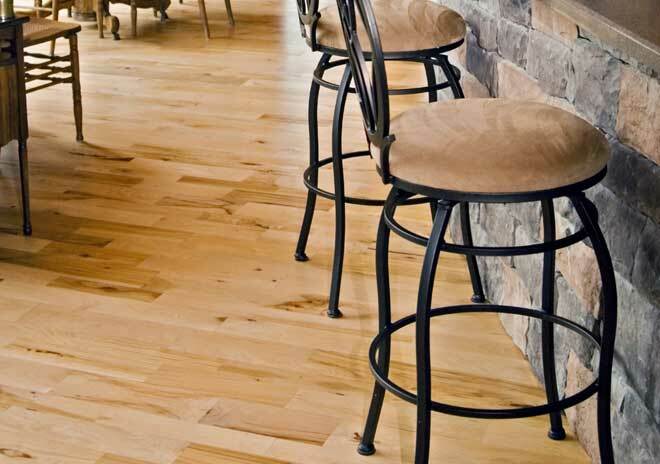 While harder than many other woods used for flooring, hickory is more prone to swelling and is less DIY-friendly. This makes hickory floors more expensive to install, but the durability allows this wood to outlast similar floor materials. For these reasons, the wood is prized for a wide variety of home remodeling projects from flooring to cabinets and shelves. Hickory has many benefits which make it more popular than other woods. While these benefits can be summed up in two main categories, those categories are generally considered the most important when planning a long-term home modification. One of the first things that may have attracted you to hickory is the high aesthetic appeal. Available in a number of options including planks and laminates, this wood has a lighter shade which can brighten a room. With waxing, natural light reflects with a soft, warm glow, adding an element of elegance to your room. The wood grain and knots tend to be much darker than the surrounding wood, making for a very natural look even if you stain or wax the floor. It can be an overlooked fact that any floor will suffer abuse. Furniture will scrape across the surface, food and drink will spill, foot traffic will add dirt or mud, and natural light may cause fading in time. The hardness of hickory makes it highly resistant to marring. It also holds stain better than many other types of wood, and waxing will increase hickory’s water resistance. Just as there are advantages, there are also disadvantages. Many of these disadvantages fall into a case-by-case basis and therefore may not apply to you. The same qualities that make hickory visually appealing may also prove to be a disadvantage. The light shade means scuff marks are common in high traffic areas. Lighter woods do not always work in rustic room design and contrast with darker English-style studies or similar dark-themed rooms. Marks caused during the cutting and sanding process are also more visible than darker woods. Finally, it is best to use wider boards to prevent the grain from creating an overly “busy” look. Although some woods such as rosewood and walnut are more expensive, hickory is rough on a tight budget. It will last a long time, but may not prove cost-effective when compared to other options. This is especially true if you are purchasing pre-finished wood. Hickory is a good choice when you are searching for a specific look, although you may find cheaper options more suited to your project. There are low-quality options for hickory, although these vary greatly in both color and durability, making it a risky choice. While it is possible to install a hickory floor as a DIY project, you may find hiring a professional installer is the easier route. The very hardness which makes hickory a good choice also means that you will have great difficulty cutting and sanding the wood. In addition, the density requires water popping to open the wood for stains. Getting an even stain will also require a wood conditioner, although the stain holds better than with other hardwoods. Although installation may still be difficult, it is possible to purchase your boards pre-engineered and even pre-finished. This option removes the need for staining and cutting the boards yourself, but at a higher cost. As hickory floors are difficult to install or replace, you should consider them to be a semi-permanent option and choose carefully before investing your time and money. Hickory floor installation is a slow process. The wood must be properly dried and will swell and contract more than other types of wood. To avoid these issues, the wood must acclimate to local conditions for a few days before installation. Hickory is highly appealing, although the very qualities which make it an attractive option are often the same factors in deciding against it. To find out whether this is the best choice for you, each factor in your project must be considered. Your budget and whether you plan to hire a professional installer or do the work yourself will have a major effect in deciding whether hickory is the wood to go with. Homewyse offers a free cost calculator for hickory flooring based upon your ZIP code. Old House Online offers a detailed guide on the difference between solid and engineered wood flooring, both of which are options for hickory floors.